Photos courtesy of CEO Dreamland. Photo Credit: Thomas Tisch. Over the weekend, hundreds of people descended on Orlando, Florida with only one thing in mind; proving that they were the best. CEO Dreamland, the inaugural installment of CEO’s platform focused event, played host to over 700 attendees competing in their games of choice – from Super Smash Bros. Melee to Rivals of Aether and, of course, Brawlhalla. And Brawlhalla showed up in force, with a large chunk of the global Top 50 showing up in Florida to vie for the title of Dreamland’s first ever Brawlhalla champion. Or, in the case of doubles, Dreamland’s first ever Brawlhalla teams champions. And Dreamland’s second ever teams champions. That’s right – at Dreamland, fans of great doubles play were treated to not one but two events, with both serving up their fair share of fantastic play and upsets, the first of which was Brawlhalla’s keyboard players upsetting Windows. 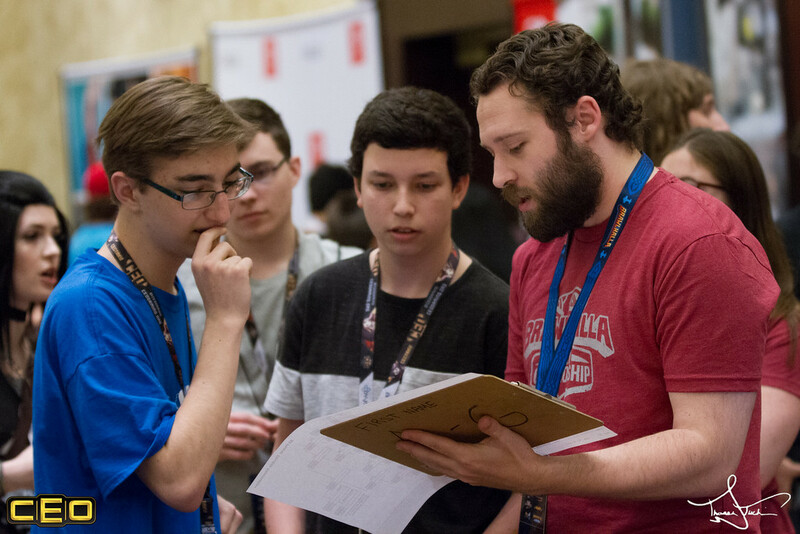 (from left) Hyper Hero and Midget check their 2v2 Pools Bracket with Brawlhalla Dev TWKsmash during the 2v2 tournament at CEO Dreamland on Friday, April 14. With doubles set to begin on Friday, friendlies were played throughout the day as players adjusted to being next to their doubles partner and playing offline. With so many static teams unable to attend, a special rule was added to encourage entering doubles anyway. Thus, many teams were getting their first chance to play together in person, including some intercontinental duos like Stevenator and Zeloxory. For players who could not compete in their official team, an offline tournament exclusive rule was put into place: instead of earning points for their impromptu team, players would earn 50% of the Circuit points, which they could then take back to their official team. This rule, which only applies to offline events like Dreamland, meant that players like Zeloxory, who was competing out of his home country, could still take part in the doubles tournament. When the doubles event began, however, things were not so smooth. Partway through the tournament there were reports of massive input lag. The Brawlhalla team discovered that the problem was exclusive to matches that had at least three keyboard players, and generally only appeared in matches where all four players used keyboards. In those matches, the actions per minute of all four players were so high that Windows was unable to keep up, and instead queued the actions, leading to catastrophic input lag. Because the issue was to do with Windows, and was particularly due to the high APM of Brawlhalla’s top keyboard players, it had never been encountered before. However, since the problem was so specific, it was only reported late in Friday’s proceedings. With matches already played and results already committed, it was deemed unfair to call a halt to the bracket; instead the Brawlhalla team decided to finish the event, and then run another doubles tournament: the Runback. With team members working into the early hours of Saturday morning, the input lag problems were rectified, and the Runback, which was played out over the course of the weekend, was played without any lag. In order to ensure that everyone was treated fairly, Brawlhalla Circuit points were dished out according to the highest placement of the two tournaments, meaning that a great result in the Runback was worth as much as the initial event. As two of the most technically sound players around, it should come as little surprise that Dobrein & Diakou were among the teams that fell afoul of the input lag problems that plagued the first day. With a shocking loss in pools placing them on the Losers side of the bracket for Top 12, the duo were unable to defeat Crockie & Doppey, finishing their first event at ninth place. 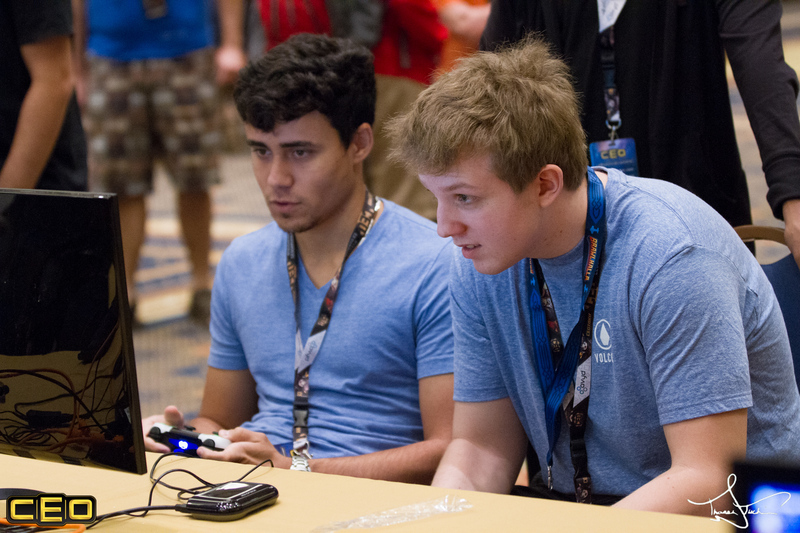 Doppey (left) and Crockie (right) play together during the CEO Dreamland 2v2 tournament. They have been a top 2v2 team in the Brawlhalla competitive scene longer than any other team on the Circuit. Dobrein & Diakou are one of Europe’s strongest doubles squads – and had their long time partnership further deepened when Dobrein was picked up by Diakou’s sponsor Eanix in the lead up to Dreamland. Though they suffered from input lag, a pools loss from a top team is always a surprise. In the Runback event, the duo seemed determined to prove their poor placement on the first day an anomaly, making Winners Finals before being felled again by Crockie & Doppey. In Losers they were bested by Stevenator & Zeloxory, ending with an improved third place finish. With the way that Zeloxory & Stevenator performed over the weekend, there’s no shame in losing to the cross-region pair. As one of the strongest teams in NA however, Flashpoint’s noeL & Blood Diamond would have wanted to defeat the temporary duo. Derailed from their Winners bracket run, noeL & Blood Diamond eventually finished in fifth after losing to Crockie & Doppey, who were among the strongest teams over the weekend. It was in the Runback, however, where the real surprises came, as noeL & Blood Diamond were put out of the tournament by the relatively unknown pairing of Midget & HyperHero. With a ninth place finish, Team Flashpoint registered their worst placing across the entire weekend, as they went on to place well in singles. That it was at the hands of a duo who were new to offline events was all the more surprising. And despite the fact that it was their first offline event, Midget & HyperHero impressed in doubles. It’s always intimidating to show up and play against the best players in the world, but performing well against a team like noeL & Blood Diamond will give the duo a world of confidence. As a team with no need for that sort of confidence boost, Crockie & Doppey spent the weekend proving that they may be the old guard of teams play, but they have plenty left in the tank. With a pair of podium finishes, they served up a reminder that they are always a threat in bracket. As the oldest surviving competitive team, it’s unsurprising that one of the key aspects of their success was cohesive teamwork. Powerful conversions and consistent followups were ever-present, though Doppey’s knack for strong arming his way through 2v1 situations certainly helped. Doppey won several 2v1 situations over the course of the weekend – which is even more impressive since Crockie is generally considered the stronger of the two. Nevertheless, whenever Doppey was called upon, he came through – a huge part of how dominant the two were this weekend. Proving himself a force to be reckoned with in doubles for the bulk of the year, Stevenator teamed up with Europe’s best Ember Zeloxory to twice run through the doubles bracket. Despite the fact that the duo were an impromptu team put together because their static partners couldn’t attend, they proved a revelation in both the standard and Runback brackets. In the end however, their inexperience as a team may well have played a part in twice falling short of taking victory. Although they entered Grand Finals on the Loser’s side in both tournaments, they failed to reset the bracket by a single game each time. The phenomenal performance of the intercontinental team was nevertheless one of the big surprises of the weekend, with strong teams being caught out in both events. Their performance inarguably speaks to the exceptional ability of Stevenator in doubles. After his second place finish at BCS with LDZ, he had to deal with suggestions that he had been carried by one of Brawlhalla’s best. With his brilliant performances alongside a handful of different partners this year however, nobody can dispute that Stevenator is one of the leading doubles players in the scene. Starlight (left) and Astronaut (right) focus in on their play during a 2v2 match at CEO Dreamland. With Starlight & Astronaut winning the initial event, multiple teams have served up notice that Boomie & LDZ have plenty of doubles competition in North America. 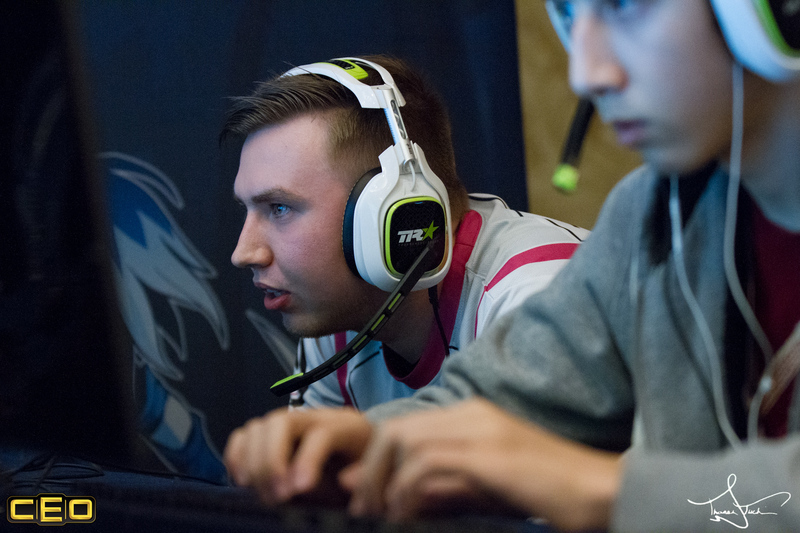 Consisting of Starlight’s commanding play combined with Astronaut’s rapid improvement, the duo have been making waves since their debut at the Winter Championships. Their victory at Dreamland will serve as proof that their partnership is living up to its potential, with every possibility that there is further excellence to come from the pair. Now that the Circuit points from Dreamland have been claimed, the doubles Brawlhalla Circuit has been blown wide open. Astronaut & Starlight have taken the lead for now, but Boomie & LDZ – the leading singles players on the Circuit – and Crockie & Doppey are hot on their tail. Will the singles maestros take back the lead? Will the scene’s oldest doubles team prove that their experience is enough to overcome all challengers? Or will last years champ and his powerhouse partner keep the lead? With a whole host of doubles events over the next few weeks, we’ll be finding out very soon.